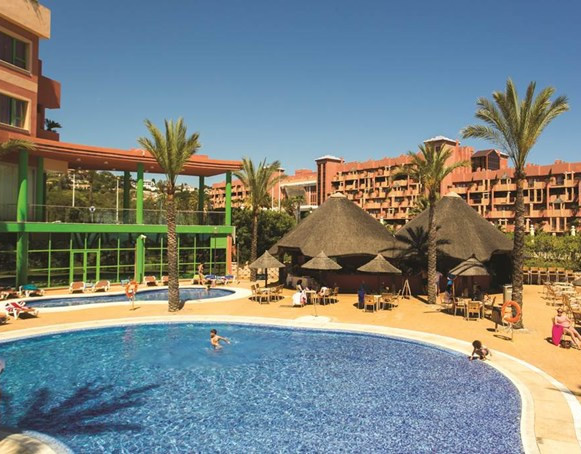 The 4 star all inclusive Holiday Palace Aparthotel is located just outside the holiday resort of Benalmadena and a short hop from the resort of Fuengirola on Spain's sunny Costa del Sol. Forming part of the four hotel Holiday World complex this popular modern hotel is forging its own well-deserved reputation for providing great value all inclusive family holidays. 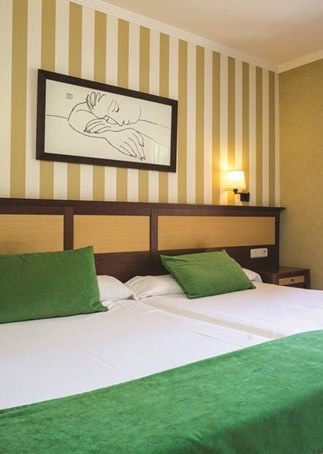 The hotel has a huge choice of facilities, a comprehensive entertainment programme and is conveniently located a short taxi ride from Malaga airport. Golfers will also appreciate this hotel's location as there are several top class courses in the area. The comfortable rooms are fully equipped and comprise of a living room with a sofa bed, bedroom with two 1.20 metre beds, full kitchenette, air conditioning, satellite TV, safe, and a terrace. Mini-refrigerator (with small freezer), Private terrace with furniture, Air conditioning / heating, private bathroom with separate bath and shower, hair dryer, telephone, television with some satellite TV channels, music system, safe, desk, cots (subject to request) room service and wakeup call facility. Families may also like to try a stay in the new Dinoworld rooms; these are Dinosaur themed rooms, colourfully decorated and dedicated to different dinosaurs, they offer all the facilities for adults and are fun for children too! 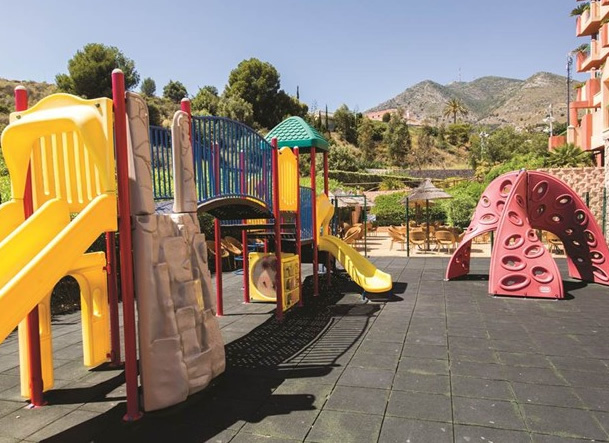 Kids will love the small tables to colour and draw, a Play station console, children’s movie rental, entrance to the Fuengirola Zoo. A complete entertainment programme especially designed for children. 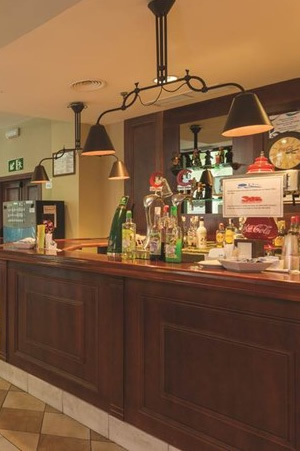 The Holiday Palace Gallery restaurant provides a great choice of international as well as local Andalucian cuisine, there is also a snack bar and cafeteria, bar and restaurant/grill. All Inclusive Food & Drinks programme consists of breakfast (08:00-11:00), lunch (13:30-15:30) and dinner (19:30-22:30), all buffet style, served in the main restaurant. During meals purified water, soft drinks, national beer, house wine, coffee and tea are offered. Snacks such as hot dogs, sandwiches, pizza, hamburgers, pasta, salads, nuggets, etc, are available between 10:00 & 18:00 at the Beach Club and the Hotel Palace. Locally produced alcoholic & non-alcoholic drinks like whiskey, brandy, soft drinks, purified water, coffee, house wine, etc are served from 10:00-24:00 at the La Tahona bar (10:00-24:00), the snack bar Chambao by the pool (10:00-18:00), the animation bar Sala Alcazaba (at night) as well as at the bar & restaurant of the Beach Club, Atlantis and Le Mirage from 10:00-18:00. In-room mini-bars are filled with soft drinks and water (on arrival day only). The Holiday Palace provides an extensive array of leisure and entertainment, the hotel has a mini-club with slides, ball pools for the kid's, mini-golf, there are outdoor adult and children swimming pools, a recreational game zone(restricted hours), spa, gymnasium, diving, bowling (at the hotel Polynesia) and much more, on the complex you can visit the hotel's Beach Club, where you can relax in one of its many Jacuzzi-pools, wave pools (reduced timetable at the beginning and end of season) or even venture into the Cave of Terror, while your kids are entertained by the mascots Holi and Worldie, ensuring everyone enjoys their family holiday. 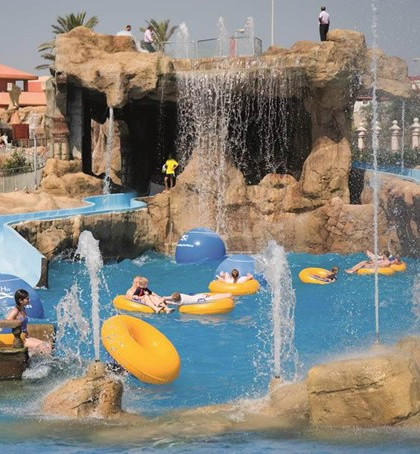 The hotel also has a team of experienced entertainment staff to keep the fun going during the day and evenings. The Hotel Holiday Palace has a well-equipped health club, here you can relax and pamper yourself, with qualified staff on hand to give help and advice to ensure you receive the maximum benefit from your visit, they will be able to recommend specific and personalised programmes that combine physical exercise, beauty treatments, anti-cellulite and much more. For your personal wellness plan the hotel has complete aesthetic treatments, gymnasium and individual rooms. 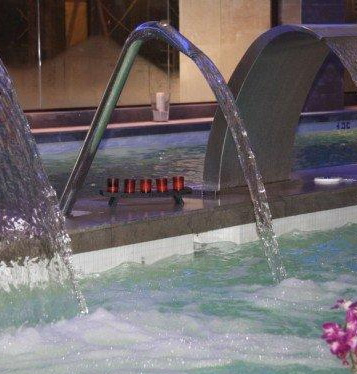 There are also a heated swimming pool, cervical jets, massage stations at different heights, an aerobics room, sauna, changing rooms, Turkish bath and gymnasium so that you can attain the optimum level of fitness and relaxation. The hotel provides a 24 hour reception, air conditioning, an ATM, babysitting service, currency exchange, football pitch, high chairs, internet access, kids playground, lifts, scuba diving, supermarket, table tennis, tennis courts, free shuttle bus to the beach. Please note some services may have a local charge.